MOSCOW: At least 10 people were killed in a fire that broke out onboard two ships, both carrying Indian crew, near the Kerch Strait that separates Crimea and Russia, according to emergency officials. 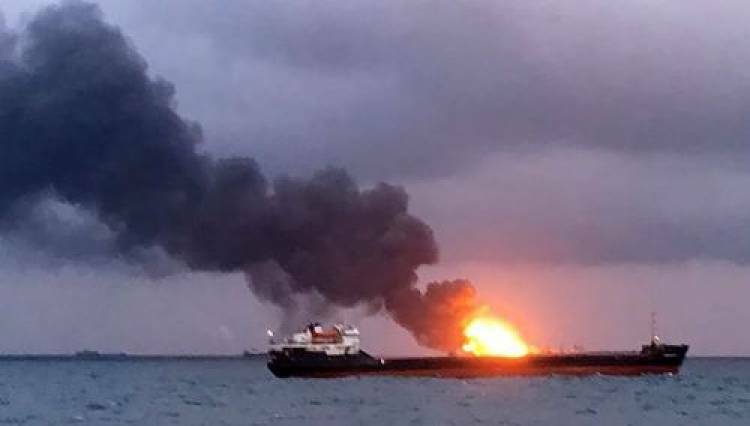 Preliminary information said the fire broke out on Monday night due to the failure of a fuel pump being used to transfer fuel between the two vessels -- Candy and Maestro -- in violation of security regulations governing such maneuvers, reports Efe news. According to Russia's TASS news agency, Candy had a crew of 17 -- eight Indian nationals, nine Turkish citizens. While the Maestro carried a crew of seven Indians, seven Turkish and an intern from Libya. A spokesman from Russia's Federal Agency for Maritime and River Transport told TASS on Tuesday that 12 people have been rescued so far and there were no chances to find any more survivors. "As of 6 a.m., the status of the operation has been reclassified to search from rescue because there is no hope to find survivors. "The fire on ships continues blazing. It will not be extinguished until all the gas burns out," the spokesman said. The rescued sailors have not yet been brought to the shore because of the bad weather conditions, he added. The victims have not been identified yet.